Today was crazy. Work, colleagues, anger, frustration. But I dont wanna talk about work. It will get on my nerve. Bid salam and greet good morning. Shyly showed him the form. HM: Why do you want to take a day off. HM: *reading and scrutinizing*... how many days you want? HM: Thursday? How bout Friday? Will you come on Friday? Me: yeppp I will. only one day. HM: why do you want to take a day off? ?,,,, oh family matter. what family matter? eh sibuk je saya ni nak tau.haha ----- yeap he did say that. Me: my husband is coming home sir. HM: Ooo so you are going to fetch him at the airport? Haha it's not that i'm going to fetch B at the airport.He will come on Tuesday. Thursday, We plan to tour around Bandar Hilir. muehheheh Stadhuys, Afamosa, Kapal Besar, Taming Sari Tower. Ooo yeahhh. newly-weds style! 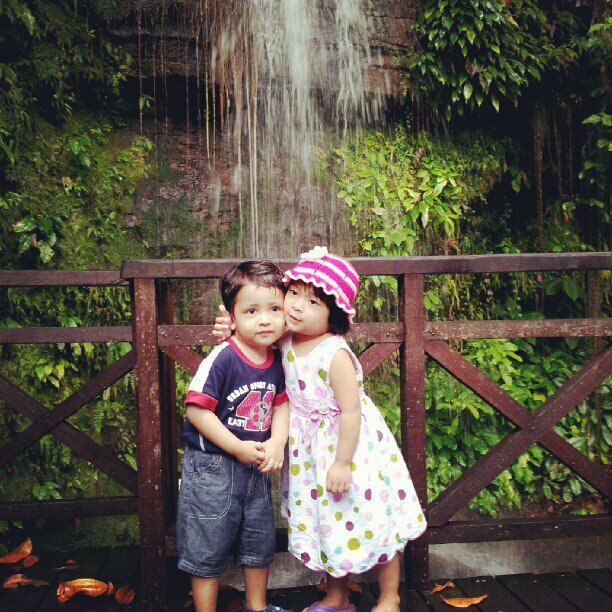 The babies at Sarawak Cultural Village. I inserted our picture for this post but deleted it. I feel shy shy to put our picture together. Dulu time dating tak malu. dah kawen malu.hahaha so will do the babies to substitute la okiess?